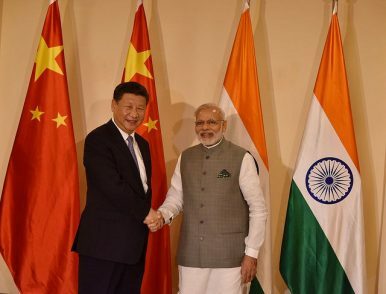 Tension between China and India has significantly diffused after the Doklam standoff “disengaged” in a mutually face-saving way and Chinese President Xi Jinping and Indian Prime Minister Narendra Modi had a 10-second-long handshake at the 9th BRICS Summit in Xiamen, China. Most recently, China expressed its willingness to reopen the Nathu La Pass, which has been closed by China due to the Doklam standoff, to Indian pilgrims after discussions. The Nathu La Pass in the Himalayas used to be a part of the ancient Silk Road; it connects India’s Sikkim area with China’s Tibet Autonomous Region. In Tibetan, Nathu means “listening ears” and La means “pass.” Through the pass, Indian pilgrims could take a shortcut to reach Mount Kailash, a sacred place in four religions (Bön, Buddhism, Hinduism, and Jainism) and undertake the Kailash Mansarovar pilgrimage. Otherwise, these pilgrims have to take the Lipulekh Pass route, a much longer and more tiring journey. In 2015, China agreed to open the Nathu La Pass, allowing Indian pilgrims to pass through Tibet annually. [T]he Indian border guards in the Sino-Indian border Sikkim section crossed the border into the territory of China… in view of the above events, for security reasons, the Chinese side had to suspend the arrangement of the Indian official pilgrimage group through the Sino-Indian border at Nathu La pass, Sikkim, into the pilgrimage, and through diplomatic channels informed the Indian side. The Chinese side highly values the non-governmental contacts and people-to people exchanges between China and India, and is willing to continue maintaining communication on the relevant matters concerning the officially-organized Indian pilgrims’ visit to China. For a long time, in the interests of China-India friendly relations, the Chinese side has made enormous efforts against all odds to facilitate officially-organized Indian pilgrims’ trip to Tibet. Based on the agreement reached by both countries’ leaders, and the fact that Sikkim’s part of the China-India border is undisputed, China agreed in 2015 to open the pass for pilgrimages. The arrangements ran well over the past two years. Notably, it seems that the Doklam standoff did catch China off guard, as China had planned to open the pass to Indian pilgrims this year before the tensions broke out. Chinese foreign ministry spokesperson Lu Kang revealed on June 28 that China’s relevant departments had been well prepared for the reception of the Indian pilgrims this year.